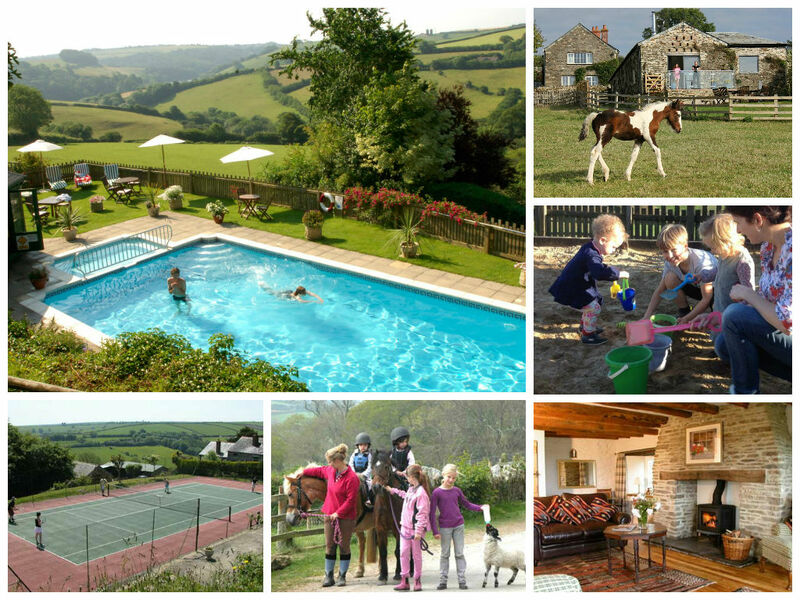 Treworgey Cottages is a complex of fifteen luxury self catering cottages set on a 150 acre farm overlooking the Looe River Valley in Cornwall. Child friendly features include a heated outdoor pool, play areas, animals to feed and horse riding stables. Treworgey is located in Cornwall’s beautiful Looe Valley, around three miles north of the picturesque fishing village of Looe, six miles from Polperro and eight miles from Fowey. Its location in a popular tourist location guarantees a wide variety of family friendly attractions in the area including many beaches, seaside villages and towns, not to mention the world-famous Eden Project around 40 minutes away. Treworgey consists of 15 cottages, each uniquely restored from original farm buildings to emphasise its original features, yet fully equipped with all mod cons to guarantee a relaxing and enjoyable holiday where everything you can think of has already been considered. There are a total of fifteen properties to choose between, ranging from the smallest one bedroom properties to larger cottages sleeping 4, 6, 8 and 8-11. 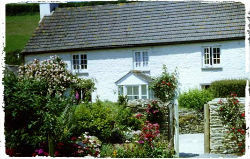 By way of example, two bed Elm Cottage (sleeping four plus cot) is one of the original Treworgey farmworkers’ cottages and features a master king-size bedroom plus a smaller twin, a spacious bedroom, and traditionally-furnished downstairs living area with open-hearth fireplace. A week long stay in Elm for a family of four costs £1879 at the height of the summer holiday peak, falling to as little as £449 out of season. There’s plenty for children to enjoy at Treworgey including an indoor playroom with table tennis, pool and a selection of toys; there’s also a unique sandy ‘indoor beach’ suitable for volleyball, badminton and, of course, sandcastle building! Outside there’s a playground with swings, slide, climbing frame, sandpit and wendy house; and of course there’s the rest of the farm’s 150 acres of land to explore and run around in too. The heated outdoor pool at Treworgey is a particular favourite amongst younger guests, enjoying spectacular views of the surrounding countryside from its sheltered sun trap location. 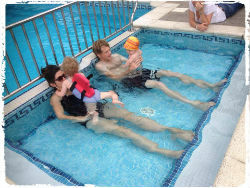 There’s a paddling pool for toddlers next to the main pool, and there’s also a handy playpen to help keep tots safe while mum and dad enjoy a swim. Next to the pool is a summer house with changing facilities, floats, a playpen and toilet, plus – and we like the sound of this! – a freezer full of local ice cream – available for a donation to the honesty box. For animal loving children, there are opportunities to help feed the friendly resident farm animals (including pigs, sheep, goats, horses, ducks, chickens and guinea fowl) and collect the eggs, and there’s also a licensed horse riding school at Treworgey offering lessons and supervised hacking through the local area. 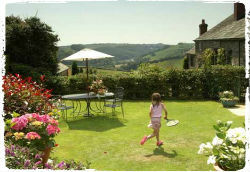 Treworgey also benefits from its own all-weather hard surface tennis court (with rackets and balls available to borrow). Every cottage at Treworgey comes with its own private garden equipped for the summer months with quality garden furniture – perfect for garden dining and providing essential reassurance that the children have plenty of safe outdoor space to enjoy! To help make dinner time a bit easier for mum and dad, it’s possible to organise the delivery of home-cooked family meals most days, and there’s also a local produce stall in Treworgey’s information room with vegetables, meat, jams, chutneys and other items available to purchase. Babysitting can be organised on request – ideal if you’d like to spend an evening in the nearby village pub which is within walking distance – and for the ultimate in relaxation a personal therapist can be booked to visit you in the comfort of your cottage. Pets are welcome at Treworgey, there’s free Wifi throughout and cots and high chairs can be borrowed on request. For a beautiful Cornish cottage in idyllic surroundings and with high quality facilities for families of all ages and sizes, we’d recommend Treworgey as a perfect holiday destination. “Children’s dreams can come true at Treworgey. Here on our 150 acre farm, they can run wild through the fields, build dams in the stream, picnic in the wood, swim in a warm clear pool, play tennis, ride a pony, help feed animals, hunt for eggs in the hay, build sandcastles, swing from a climbing frame.. the list goes on. If you’d like to find out more about family friendly holidays at Treworgey Cottages, including booking and availability enquiries, just fill out the form below.